Whether you are the only fundraiser on staff at your ministry or have a full fundraising department with multiple personnel, fundraising will be easier and more successful when the fundraising function is well-managed. 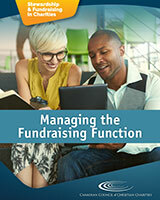 This e-book (PDF) is the textbook for the Training Centre course Managing the Fundraising Function. When you purchase this e-book (PDF), you will receive a link in your email receipt to download your PDF.